Today, another one is leaving us. This time it is my very good friend Catherine who has seen me through all sorts of crises both personal and work related, and I am only just coming to terms with not being able to see her every weekday as I have for the past two years. Instead Miss Miles will be heading home to Bournemouth to pursue a career in Urban Design – something she has been working towards throughout her career, so we can only be pleased! As we bid Catherine ‘farewell’ however, we once again have again embraced this chance for silliness. I say this sitting in an office full of professional planners going about their business wearing paper hats made out of Thursday’s edition of ‘The Times’. I think Jim rather suits his…. Good bye and Good Luck Miss Miles! You will be dearly missed. Eyes closed, deep breath, head down…GO! As you may have gathered from the rather desperate plea below to Mr Savile, I have been approaching the start of the new academic year with enormous trepidation. Indeed, there is nothing like having 4 months of your own free time given back to you to remind you what it is like to lead a normal life again – where the only scary deadline involves using up the roasted vegetable humous in time, and reading books can once again be a leisure pursuit (although I still found myself desperate to make notes in the margin and reference the publisher in ‘Havard Format’). First day back at ‘Brookes’ however and all was better than I had anticipated. I would even go so far as saying enjoyable. It was of course great to see my friends and catch up on who has a new hair do/tan/diet/house/car/mrs/job/kitchen, and Claire reported some very anti-social behaviour in the dorms of an Edinburgh youth hostel (unfortunately I can not divulge such information in case of pre-watershed reading). I must also admit to being very pleased with my choice of ‘elective’ this year, being the only one to have a field trip (to Birmingham) thus indulging several of my interests; journeys, new places and people that can’t speak properly and wear shell suits*. I just know they’re going to love me. So, although the word ‘dissertation’ still scares the bejesus out of me, I’m terrified of the amount of work I have to do, I have no idea how I’m ever going to give a presentation that is half an hour long and not on a subject related to tractors or Colin Firth….I have to remember I’m on the final straight now, there really isn’t that long left of my course, and there is even potential for it to be fun! Thank goodness the door was open. * Disclaimer: This blog has not been censored for political correctness and does not intend to cause any offence to people who live in Birmingham (or its surrounding districts), have relatives from or originate from Birmingham, or have none/any of the above and still own a shell suit. Shell suits are flammable when exposed to a naked flame and can cause serious injury to ones sense of style. Jim did used to wear a shell suit in ‘Jim’ll fix it’. Jim’s ‘magic chair’ was actually made in Reading! I’ve lost sight of why I’m writing this now…. Please, please, please will you fix it for me to receive a first class masters dissertation relating to the subject ‘regeneration’ and have really clever academic type people (you know the ones – beards and really smelly breath) to write my assignments for me too. You see tomorrow Jim I start back at University for the final year of my ‘Planning’ masters degree. I will get up at 5:15am to get there too. Jim, this is not a good idea as at this time I am grumpy, irrational and my appearance is likely to scare young children. On top of this Jim I will be asked to listen, think and learn. I find this deeply unreasonable Jim as the modern day does not require me to pay attention and listen any more – instead I can download the ‘highlights’ in a podcast, I do not have to think any more – Wikipedia does that for me, and anything I will ever need to learn can be found on Google and YouTube. Instead Jim, I think my time would be better spent supporting the local and international economy. I have proved how successful I am at this during my summer break, investing in the clothing stock of many high street stores, I have made it my duty to help maintain the business of many bars and restaurants, and I made a special trip to New York this year to support culture and the arts whilst also trying to improve the standards of written English over there (I am in particular support of the much endangered letter ‘U’). Age 25 and more than 3/4. P.S Would some ‘Elizabeth Duke’ vouchers swing it? Do you ever find that random thoughts just pop into you head quite unexpectedly and take you by surprise? This appears to be happening to me with increasing frequency and in the most unlikely of places. For example, on Monday when I was loading the dishwasher, the name ‘Dean Gaffney’ flashed across my brain. Having no idea of who this was, and having wrestled the pasta bowls into position, I ‘googled’ only to discover that he is an ex cast member of EastEnders with a very conspicuous nasal feature. On Wednesday, for some reason – just past the Reading motorwary services whilst travelling along the M4, I felt a strange need to find out whether Bill Oddie was married. For anyone interested, he is indeed, to a lady called Laura Beaumont (his second wife, Jean Hart being his first). On Thursday I was tucking into a lunch of Cajun Chicken (heartily recommended), and it occured to me that Giraffes are quite large animals, and I wondered whether like big dogs this means the age they live to is adversely affected. Because this is something I’m sure you too have often agonised over sitting at home with your cup of tea, or perhaps putting out the dustbin, I will tell you; Giraffes can live up to 27 years of age, their average lifespan however being only 10 years. Personally I’m hoping to come back as an elephant – they live to be 70 and still look good even without night cream. Ubiquitous – adjective: exisiting or being everywhere, esp. at the same time; Omnipresent. I just looked it up. What a lovely word. If I’m honest the whole purpose of today’s post really has been to use ‘ubiquitous’ in a sentence, as along with ‘Serendipity’, ‘Nostril’ and ‘Crampon’ it has become one of my favourite features of the English language. I would also like to take this opportunity to thank you for baring with me through such times of random brain activity. You see, I have decided that as the grey matter controls what I write, and with my University course resuming next week, I have decided to let it run off the lead for now and do want it wants – catch a few sticks or chase the odd cat for example. I just hope it comes back when I call it. Iain: “This is probably going to end up on your blog isn’t it”. Today Iain celebrated managing to survive two whole summers with us in ‘Planning Policy’ which, along with all of the obvious benefits of gaining solid work experience, has been useful in providing further confirmation that upon leaving University, Iain does not wish to pursue a Planning career. Mr Lock will be most missed for upping the ‘young people’ numbers, providing car park companionship for my small blue hatchback, being as rubbish as me at map reading (meaning several return visits to some sites), for having a healthy regard of Wellingtonia Avenue and the fact that ‘Nine Mile Ride’ is really that long- and his extensive knowledge of the Molly Millars area was truly impressive. 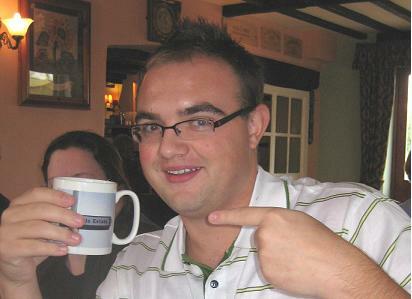 For his leaving gift Iain received a mug with pictures of a Wokingham Industrial Estate on it, with which he seemed genuinely delighted. As good an indication as any…. it was time to leave the Planning Office. I am a bit of a fan of the English weather in that it appears strictly independent of anything else dictating the time of year. Last week, despite being mid September with kids already back at school and Halloween costumes decorating the window at Woolies, it was most definitely summer still, and one could stroll out quite happily without a cardigan and not feel nervous. 1. Clothes are not always as they seem. Not only might the clothing you chose to wear appear a completley different colour in the dark, but the billowing shirt you attempt to make fit your body might not even be yours. If this mistake is only realised however when you have reached your car, always take a jumper with you to cover up all evidence of wearing mens clothing so no-one will notice. 2. Approach blusher application cautiously in dimmly lit conditions. The ‘rosy glow’ you were going for has the potential to look like ‘fell asleep on sunbed’ if you don’t make sufficient compensation for illumination levels. 3. Never attempt to use anything aerosol related unless you can access a light bulb or are in a well ventilated area. Inability to see the direction of the nozzle may lead to temporary blindness, deafness, coughing/sneezing fits, suffocation of ones sleeping partner, misting of ones mirror, and in my case, mortification that instead of having long and glossy locks I had instead deodorised hair. Now I have cottoned on to the above hopefully I can make the necessary preparations the night before so my mornings run more smoothly – although this is slightly wishful thinking considering I barely have enthusiasm to even move when I get home, let alone be organised. So all I can do is stop whinging about the dark mornings and enjoy the prettiness of the Autumnal leaves, the crispness of the morning air, the dew on cobwebs, the deep orange sunsets and cosy nights in beside the fire (or in our case cosy nights in by the fan oven which gives a very similar effect – particularly if I’m cooking). Oh, and be grateful that I like Neil’s taste in clothing…. As mentioned in my last post, Neil and I were fortunate enough to attended ‘Wedding of the Year 2007′ at the weekend, as Gary and Marie-Claire became lawfully responsible for each other. Admittedly Marie-Claire did look the most nervous at this prospect, but having seen Gary’s outlandish antics (including diving on the lawn in front of the Greek Parliament during our field trip to Athens), this was more than understandable. It was all smiles however once the knot had been tied, and with Inga’s beautiful singing during the service, it was easy to see which guests had had the foresight to wear waterproof mascara (I was not one of them). After the ceremony it was on to the reception in a beautiful converted barn, decorated to the rafters with fairy lights and candles galore, all of which helped to make the place feel a little bit magic. Neil was also particularly pleased to have found a favourite foodstuff presented as a favour on our tables, although was a little dismayed that the little pot of Essex jam was labelled ’15th September 2007’. Having however realised this was as a momento of the occasion and not the sell by date of the product, he carefully stowed his and my pot away ( am sure I’ll be lucky to see that again….). Higlights of the day for me had to be the excited anticipation of seeing Marie-Claire appearing at the doors of the Church, the Best Man’s Land Rover Defender dressed in ribbon, the maginificent plethora of outfits worn by attendees including an impressive fleet of kilts and fascinators, and the realisation that – guess what – I was ‘the girl’ who wore the same dress as someone else. Fortunate for me, I knew that someone else, and Steph and I made a point to compliment each other on our outfits throughout the rest of the day (the girl did look stunning). So I hereby present above the newly married Mr and Mrs Tovey – pictured above of course, although sadly being a guest without crowd negotiating skills, I was only able to capture a side profile of the Wedding Party. But what lovely noses they all have. – Just have to pop to M&S I suppose. which is in Essex – yes, tomorrow we head East! Here’s wishing you all the best in life! When I was younger, nothing delighted me more than receiving a parcel of ‘making things’ for a Birthday or for Christmas. Such a parcel would normally contain an essential packet of felt tips, some string, a small Pritstick, possibly some kiddy scissors, and most excitingly – my own roll of Sellotape (something that was given high regard in our house and was not to be wasted). Following such an occasion I would normally accompany my parents on their trip to the supermarket where I was allowed to scout out the crate of cardboard boxes left for customers whose purchases required transit in something sturdier than a plastic carrier bag. I would spend at least 15 minutes inspecting the various boxes as to their size and shape, and having chosen my perfect specimen, I would clutch it carefully (and with great pride) to my chest until I arrived home when work would begin…. Perched on a chair at the kitchen table, out would come my ‘making things’ parcel and given an hour or two my supermarket box would become a Sindy Castle, or a horse box for Roller Skating Ken’s show pony, or a hideout for my lego men or a hole would be cut in the front to make way for ‘Turner Television’ – much to the delight of my parents I’m sure, whom I remember being made to watch several broadcasts. Admittedly none of my creations would have won any prizes for engineering, and normally within a couple of days the dog would have chewed off the sticky tape draw bridge from my fairy palace box, or my drinking straw ‘moon landing ladder’ and lemonade bottle ‘rocket pack’ would have fallen off of my spaceship (having never made it into orbit), and the whole thing would have to be binned – but that never mattered. Boxes were by far my most favourite thing to play with because they could become anything you wanted, just so long as you could think of it. I have been told by many a person that you get on in life by thinking ‘outside the box’. Maybe my problem is that I have spent too long pondering what I could make out of it. Sitting beside me right now is an empty tissue box I am having problems parting with. It’s stripy and pink, and could look fabulous with just a dash of glitter and maybe some Quality Street wrappers (if I could get hold of some) taped around the side. I’m sure Neil could do with a pen tidy….